Kanberra Gel Liquid Spray Bottle is filled with natural, pharmaceutical-grade Tea Tree Oils with antiseptic properties. The air absorbs the sprayed oils on a micro-biotic level. As the air circulates and lands on the source of mold, mildew, fungus, odor, etc., the Kanberra Spray begins neutralizing and eliminating associated odors and problems on contact. 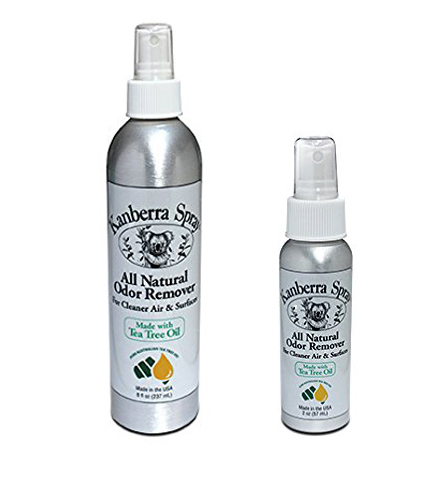 The Kanberra Spray naturally eliminates odors without the use of chemicals and is safe for use around children and pets. Kanberra Spray does not mask the odor. It eliminates it. When the Kanberra Spray is working there is only one smell: clean air as nature intended. There is no fragrance, masking or perfume. Just clean air. A natural solution to address odors, mold and mildew in almost any location - from boating applications to wash rooms! Packaged in 2 ounce or 8 ounce non-aerosol containers. Optional 64 Ounce Spray Refill available. Kanberra Gel Tea Tree Oil Diffuser Kit and Kanberra Tea Tree Oil Wipes also available.